Lineage. Constituted 328th Fighter Squadron on 29 Sep 1942. Activated on 1 Oct 1942. Inactivated on 10 Nov 1945. Redesignated 149th Fighter Squadron, and allotted to VA ANG, on 24 May 1946. 149th Fighter Squadron extended federal recognition on 21 Jun 1947. Redesignated: 149th Fighter Bomber Squadron in Dec 1951; 149th Bomb Squadron (Light) on 1 Dec 1952; 149th Fighter Interceptor Squadron on 15 Jun 1957; 149th Tactical Reconnaissance Squadron on 10 Apr 1958; 149th Fighter Interceptor Squadron on 14 Jun 1958; 149th Tactical Fighter Squadron on 10 Nov 1958. 192nd Tactical Fighter Group extended federal recognition on 15 Oct 1962. 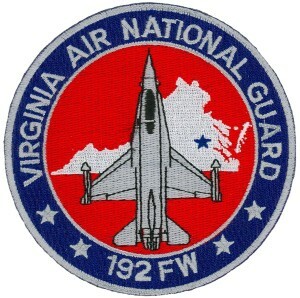 Redesignated: 192nd Fighter Group, 15 Mar 1992; 192nd Fighter Wing, 11 Oct 1995-. Assignments. 352nd Fighter Group, 1 Oct 1942-10 Nov 1945. Virginia ANG, 21 Jun 1947-. (Gained by: Tactical Air Command, 15 Oct 1962; Air Combat Command, 15 Mar 1992-). Components. Groups. 192nd Operations, 11 Oct 1995-; 192nd Maintenance, 11 Oct 1995-; 192nd Medical, 11 Oct 1995-; 192nd Mission Support, 11 Oct 1995-. Squadrons. 149th Fighter, (later: Fighter Bomber; Bomb; Fighter Interceptor; Tactical Reconnaissance; Tactical Fighter; Fighter), 15 Oct 1962-. Stations. Byrd Field, (Richmond IAP),VA, 21 Jun 1947; Joint Base Langley-Eustis, VA, 13 Oct 2007-.